The readers have spoken. 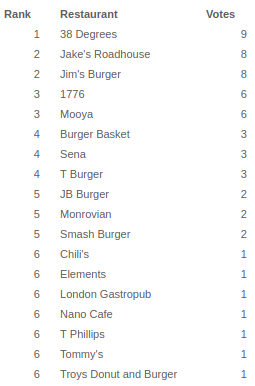 The best burger in Monrovia is at 38 Degrees, with 15.3% of the vote. 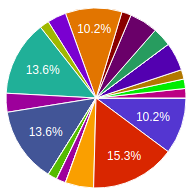 Followed as close seconds by Jake's Roadhouse and Jim's Burger, with 13.6% of the vote, each. I agree with the result, but wonder how it might have turned out if we had asked what is the best burger for under $8. But, yeah, the 38 Degrees burger is pretty amazing! I miss The Market Grill. They had awesome burgers.